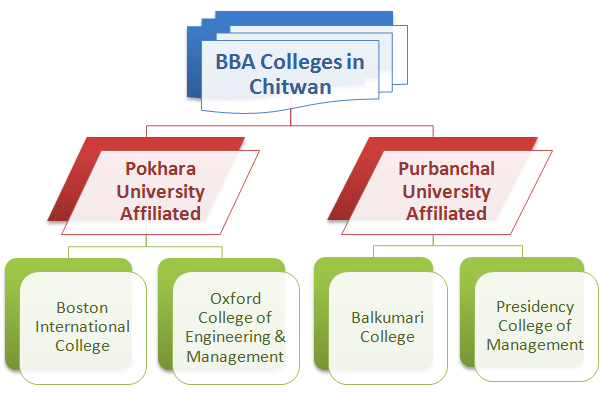 There are altogether four BBA colleges in Chitwan and nearby district Nawalparasi. In the last post, I briefly reviewed four universities of Nepal that are currently providing BBA degree in Nepal. Now, in this post, I will provide you the information about the four different colleges which run BBA programs. Among them, three lie in Chitwan district whereas one lies in Nawalparasi (Gaindakot) district. You can attend all these four colleges from Chitwan. So, if you are going to decide which college to choose to pursue your management studies in the bachelor level, this article will be helpful to you. Established in 2010 AD, Boston is committed to impart top quality education to the students. I personally recommend you this college because firstly, I studied at Boston (am now a proud Alumnus) and secondly Boston is the most innovative and most committed business school in Chitwan, which provides practical knowledge and skills along formal business education. Boston college features only two programs, BBA and BBA-BI, of Pokhara University. Therefore, it has specialized in providing business education and frequently conducts business workshops, guest lecture classes, training, seminars, industrial trips, and the like. Currently, Boston implements Boston Complete College Program (BCCP) program to make students more employable after they graduate. Similarly, BBA-BI, shorthand for Bachelor of Business Administration in Banking and Insurance, is a new program available at Boston for students who have special interest in banking and insurance sector and this course was provided in Boston only when I was an student. You can view detailed information about Boston at www.bostoncollege.edu.np. For its commitment and approach in delivering practical business education, I think, Boston can be rightly called one of the top Business Schools of Nepal like the Ace and Apex. Oxford College is another college which provides the BBA degree of Pokhara University. Oxford college runs many other programs like BCA, BE and so on. As a result, the management might not get time to focus on BBA only to organize guest lectures, industrial visits, workshops and similar programs which can help the students to gain practical skills useful for their career in the future. You can learn more about OCEM in its website at www.oxfordcollege.edu.np. Presidency College is affiliated to Purbanchal University (PurbU). All the disadvantages of Purbanchal University are automatically ascribed to this college. I think this is a good college, however, I can't say that it is as committed as Boston to provide excellent education. Learn more about this college from its own site at www.pcms.edu.np. Balkumari College is also affiliated to Purbanchal University for its BBA course. However, apart from that, Balkumari is a strict and well managed college in the town. It has also a cheaper price structure as compared to other colleges and there is good competition among the students to get admitted to the limited number of seats available in Balkumari College. More about Balkumari College in its own website at: www.balkumaricollege.edu.np. "Skills for Employment" training, an intensive 16 hours training program delivered by London Chamber of Commerce & Industry (LCCI) Nepal from December 20-22, 2014 at Dhulikhel Mountain Resort, Dhulikhel from LCCI trainers: Manohar Man Shrestha, Abilash Acharya, Deep Ram Tandon and Roshan Rathi. "Conducting Seminar" workshop at Boston on April 5 and 6, 2014 delivered by Sohan Babu Khatri, who is a prominent scholar, entrepreneur & mentor. Guest Lecture class on "Entrepreneurship" on September 21, 2013 also by Sohan Babu Khatri. Therefore, for an ambitious business students, who want to make a career in middle and Executive level managerial positions or want to start their own businesses as an entrepreneur, Boston is a right place to be.